I am still pretty much into HEOS Bar. That seems to be the closest equivalent to a AVR/speakers Combi with its number of inputs and features. Does anyone know a good place to get the Yamaha YAS 207? What's the lowest price for it? Pete. Can try to speak with Rino of Yamaha, at Audio House. I got my 2070 through him. PM you his HP. Philips have their biannual sale this weekend, there should be some soundbars on sale.. I'm looking forward to B5 with large discounts. Where and when is the Philips sale? 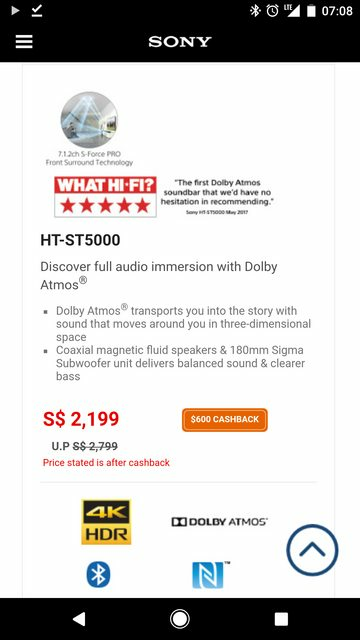 I saw four soundbars on sale, ranging from 399 to 1.6k..
Not too impressed so it's likely that I will try the Yam YAS 207 instead. hi Pete, did you manage to audition the YAS 207? where did you do it and how much is it going for? i'm in the market for a soundbar as well. i'm also looking at the samsung models. i don't need anything fancy. just a soundbar with an accompanying sub woofer. my main uses are with singtel mio TV for soccer and regular TV programs plus stuff that I would be streaming over the google chromecast. my current TV is a samsung, which i got from Viewqwest during a promo more than 2 years ago. i think it's 48" wide, with 2 HDMI ports and an optical port. I didn't, but nevertheless I will be getting one end of the month for my in laws. If you are able to wait we could go down to Audio House together one of the days after 20th and get a set. I hear it's under 650 there. thanks for the offer Pete. I'm out of town currently and will only return mid December. in case you have not got yours by then, we could go check it out together. Can get more discount? If can I join you. I just contacted a sales rep from Audio House, courtesy of bro invoice.. I don't mind waiting til December for the deal, so if you want, we can go down - Makan first heh then do the deal.. I am sure there's more good food in the Bendemeer area that I haven't tried. Only HN and AH carry Yamaha soundbars.. Seems like there is promo now for the YAS 207.